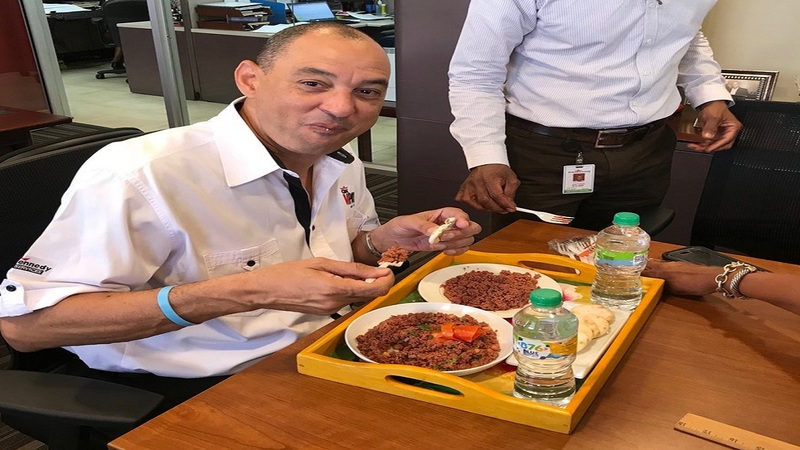 :(L-R) Grace Foods newest Global Brand Ambassador Kemar 'Ding Dong' Ottey gets candid with CEO of Grace Kennedy, Don Wehby. 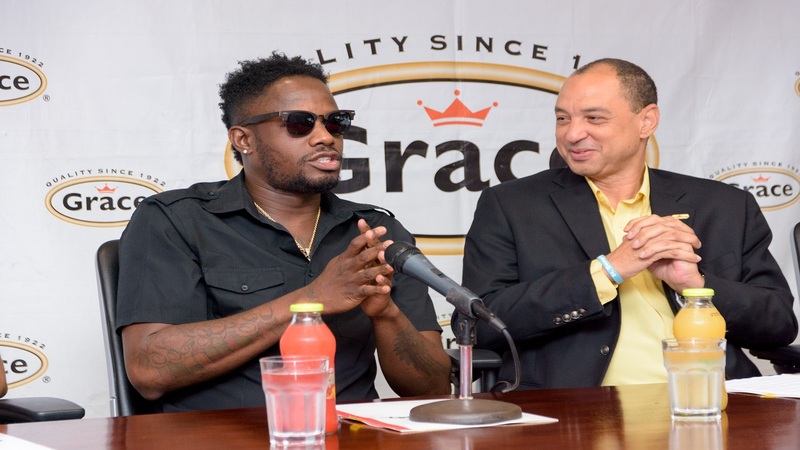 Grace Foods has signed popular dancehall entertainer Ding Dong, as the first non-athlete Global Brand Ambassador. “I have been asked on numerous occasions why Grace Kennedy is not more involved in the creative industry and I always said that when the right person comes along I will sign a Brand Ambassador from the Creative Industry. I met Ding Dong recently and after speaking to him for two minutes, I knew that this is the gentleman I wanted for the Brand Ambassador for GraceKennedy. 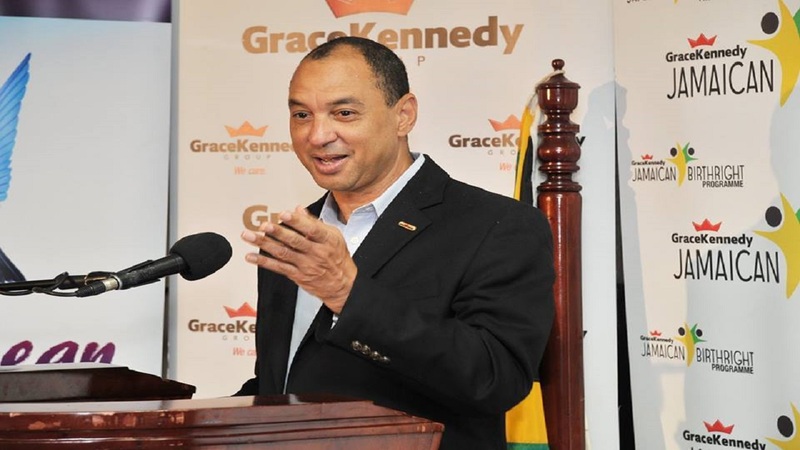 He represents what is needed in this day in Jamaica - a good role model to our youngsters with clean lyrics and positive vibes,” stated Don Wehby, CEO, GraceKennedy Limited. 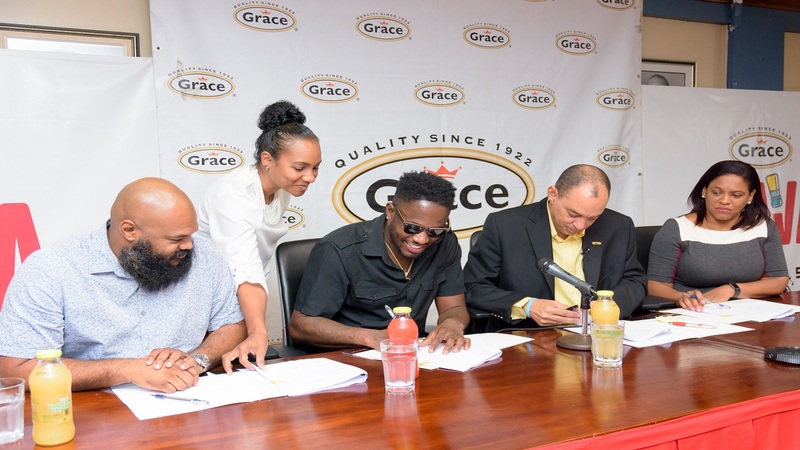 Grace Foods, a subsidiary of the GraceKennedy Group, first approached Ding Dong earlier this year to be the voice of their “Flava with A Beat” campaign that was aimed at refreshing the Grace Foods brand. This, to remind consumers of the positive and energetic vibe and the joy that exudes from the brand that is so close to the hearts of many, at home and around the world. The overwhelmingly positive response from the public toward the campaign prompted an extended partnership with Ding Dong, leading to his official acknowledgement as the first global Brand Ambassador from the creative industry. “It has been a real pleasure to be a part of this company at every level. When I think about where I’m from and what I’ve been through and to know that I am now representing a brand like this is overwhelming. 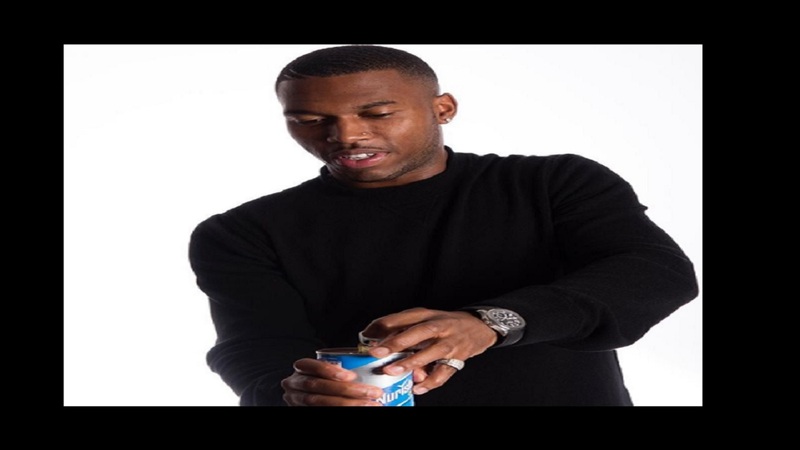 It is not just a big thing for me, but a big thing for the youth from the inner city, the dancehall fraternity and the music industry,”stated Kemar “Ding Dong” Ottey. Although the partnership was just made official, Ding Dong and Grace Kennedy have already been hard at work. In May, Grace Foods surprised Ding Dong with some products, having seen a “run a boat” initiated by the community a few days earlier. He shared the products with the community, which led to a series of “boats” on corners throughout Nannyville, showcasing delicious and creative Grace Mackerel dishes. Also, a new advertisement featuring ‘Flairy Mackerel’ and the Ravers was recently launched. “The ad that we currently have running with Ding Dong and Flairy Mackerel has brought so much positive feedback. I think what makes it so great is that Ding Dong cuts across all demographics and social classes. In fact, that’s the great thing about this partnership between Ding Dong and Grace Kennedy. We both represent Jamaica and we both represent everybody - not only the rich or the poor. Everybody enjoys our food - the mackerel, the corned beef, everything - and they love how Ding Dong entertains and that’s why we’re going to have a great partnership going forward,” Wehby said.